Alzheimer's & Dementia Weekly: Sundowning: Is My Body Clock Broken or Just Disconnected? Early-evening restlessness and agitation, known as 'sundowning', is common in Alzheimer's. So is fragmented sleep. A major discovery indicates these symptoms are curable. Now, scientists from Cambridge have discovered that in fruit flies with Alzheimer's the biological clock is still ticking but has become uncoupled from the sleep-wake cycle it usually regulates. The findings -- published in Disease Models & Mechanisms -- could help develop more effective ways to improve sleep patterns in people with the disease. Until now, however, it has been unclear how Alzheimer's disrupts the biological clock. According to Dr Damian Crowther of Cambridge's Department of Genetics, one of the study's authors: "We wanted to know whether people with Alzheimer's disease have a poor behavioural rhythm because they have a clock that's stopped ticking or they have stopped responding to the clock." The team worked with fruit flies -- a key species for studying Alzheimer's. Evidence suggests that the A-beta peptide, a protein, is behind at least the initial stages of the disease in humans. This has been replicated in fruit flies by introducing the human gene that produces this peptide. 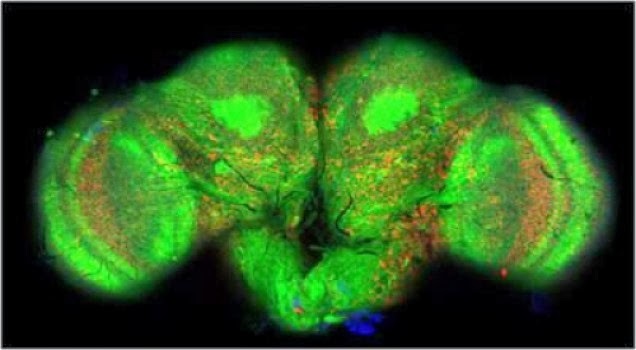 To study the flies' biological clocks, the researchers attached the protein luciferase -- an enzyme that emits light -- to one of the proteins that forms part of the biological clock. Levels of the protein rise and fall during the night and day, and the glowing protein provided a way of tracing the flies' internal clock. A wonderful study, thank you! As a professional in the field of dementia I had never considered the idea of certain parts of the brain ignoring the biological signal to sleep. Well done! My husband sleeps til almost noon everyday. When we have an appointment, it's all I can do to arouse him and get him to shave and dress himself to leave after breakfast. Then he has forgotten where we are going and who we're going to see. He absolutely refused to come into the office waiting room today and I had to convince him that he just had to wait for me and then he sat and read a magazine. As for sleeping at night, he's good at falling asleep just after the news and as I said before sleep until almost noon. He hasn't experienced 'sundownners' as yet. Maybe it's just him or another thing to 'look forward to'. Thank you for your interpretation of sundowning and sleep-related behaviour. Less light means that my husband sees less well and becomes quite confused and disorientated, even at home. Out and about his anxiety gets worse at sundown / dusk, as if he is searching for appropriate behaviour but cannot find any memories to draw on to support him. He needs an enormous amount of reassurance at sundown/dusk, and then he will trust and follow my lead. I agree sleep-related disturbances are partly caused by medication imbalances. My husband's chronological clock has been disrupted by brain damage, so he needs reminding about what time it is, and he rarely associates the coming and going of daylight with set behaviours - he has forgotten / lost a lot of the memories we take for granted. I really believe that everyone is unique in their behaviour, but some generalities can also really help the Carer decide how to respond for the best. Thank you again. Lovely article...but it gives no hope for the caregiver. The body needs rest...when loved ones don't sleep neither does the caregiver....how about publishing an article with applied knowledge pertaining to actual solutions. (as a dose for a small child) and controlling blood presure). Talk to the doctor about it. Well put, Jessica. I get all excited when I see a headline, such as the one that pulled me into reading this article, only to learn that there isn't anything available right now. Working in a 30 bed assisted living facility for memory care residents, we are dealing with several individuals who have been admitted because their family caregiver just wore out trying to keep up with someone sundowning and awake all night. Current options include sleeping pills or antipsychotics, which we DO NOT use because of the increased risks involved. Our saving grace is that we have a night shift who remain awake and on duty, often following, attempting to redirect, and always striving to keep said residents safe. But for those who still have their loved ones at home, I find it misleading to read articles such as this. You're certainly touching an essential need for "applied knowledge pertaining to actual solutions" There are articles and videos about it on this site. Just go to the right hand column, find the box with the title "Pick a Topic" and click on "SUNDOWNING". Judy, I think that most facilities need to change their routine to fit the patients needs (vs medicating). I stumbled upon an article about a program run at a facility in NYC. They have a dedicated team from 7 pm to 7 am that run an activity program for those who are up all night. We often try to change the individuals normal body cycles to fit the 'regular' world. I am a caregiver to my Mom (age 91) ..... she was always a night owl and I rise at dawn ! I now have altered my schedule to fit hers ( I go back to bed for a while or catch a nap if someone can cover for me). This works ! Mom is no longer on sleep medication which produced it's own nasty after effects. I wish more care facilities would use logical thinking when trying to solve problems . In most situations in life if something is not working we figure out a better plan. I don't know why this isn't obvious in this situation ! Jessica, the psychiatrist prescribed quetapel for my husband and since taking the medication we sleep through the night, first time in years. I agree with Jackiemartinart, for a number of reasons. (2) The term "sundowning" is, at best, a misnomer. Broadly speaking, sundowning is a cyclical increase in agitation (which may include restlessness, confusion, disorientation, wandering, searching, escape behaviors, tapping or banging, vocalization, combativeness, and/or hallucinations) that takes place at roughly the same time every day. Despite its name, and the wide-spread belief that sundowning occurs in the late afternoon and early evening, studies have found that the peak of sundowning activity is just as likely to occur in the early morning for a given individual, or in the early- to mid-afternoon (e.g., around 1:00pm), while in some patients, it may occur late at night. Sundowning and sleep disturbance may appear to be related to each other since a sleep disorder, such as sleep disordered breathing, can be associated with daytime behavior disorder. There is a popular hypothesis that sundowning is a chronobiological phenomenon that is unrelated to sleep disturbances but, rather, by a disturbance in the normal circadian rhythms. Results of studies on this hypothesis, and potential related treatments such as bright light therapy and/or melatonin supplements, have produced conflicting and contradictory results, however. Moreover, the roles of melatonin and its associated receptors and the effects of Alzheimer's on their expression are very complex and not at all well-understood. Some studies have concluded there is no such thing as sundowning per se. (3) While the fruit fly study is interesting and quite elegant, it is quite a stretch to draw conclusions about dementia patients from studies on genetically engineered Drosophila. This article says that "A-beta peptide, a protein, is behind at least the initial stages of the disease in humans. This has been replicated in fruit flies by introducing the human gene that produces this peptide." Well ... no. In the human brain, the transmembrane protein, amyloid precursor protein (APP), is produced. A-beta peptides, either a 40- or 42-amino acid chain, are produced by the proteolytic cleavage of APP by beta- and gamma-secretases. Lipid rafts are involved in the regulation of APP proteolytic processing and A-beta generation, and it is thought that the aberrant lipid content of the neuron membranes in the Alzheimer's brain causes improper APP cleavage that leads to the formation of Alzheimer's plaque. The fruit flies in the study do not replicate the proteolytic processing of APP. Instead, the researchers have "fused the A-beta peptide with a secretion signal peptide and driven its expression in the nervous system." I.e., instead of A-beta 1-40 or A-beta 1-42 being produced, the fruit flies produce a chimeric polypeptide that, by definition, has a structure far different from Alzheimer's A-beta, and unknown functions/properties in the fruit fly nervous system. As for practical solutions to the caregiver's problems (my heartfelt sympathy, Jessica!) ... you cannot treat the symptoms effectively without determining what might be causing them. The articles I cited, on sleep disturbances and "sundowning", discuss the various possible causes and some potential solutions. And I fervently hope you figure out what works for your loved one! I ended up having to think WAY outside the box, and asked my husband's doctor if we could try prazosin. She was knowledgeable about its use in treating PTSD and the clinical trials for treating agitation in Alzheimer's patients, and prescribed it for him. My husband was getting depressed without me realising it. When the doctor took him off sleeping pills of any kind and we replaced these with anti-depressant pills his mood lifted and he is really on top form. The sleeping disturbances still happen at night, related in part to my mood, where I am in the house and his anxieties. I have night Carers to take over some nights so I get a full night's reat. He has adjusted to this and we continue to live together at home - a home from Home. The day he goes into a Home is when he knows me/us no more at all. Lilian, I am also keeping my husband home with me as his main care giver and he does have some sun downing causing his to become agitated. I think my husband is more bored than depressed. What agitates me the most is almost all of my friends just keeping asking me when I am putting him in a home. Do have this issue also? I understand those that were disappointed by the 'no cure' only reason information contained in the article. But I believe the point was that, now that we know it's not the Alzheimer's that is creating the disruption in their brain regarding time of day and sundowning, we can at least look for a cure or solution to help with the disruption. That the disruption is not futile. Anecdotally speaking, it makes sense that the biological clock (very primitive brain function) is still intact in Alzheimer's disease, but the poorer functioning higher level cognitive functions override the impulse to sleep. Chronic anxiety and overthinking cause most of us to wake up during the night. We all demonstrate that behavior at some point, and regardless of how tired we are, troubling thoughts or underlying agitation disrupt our sleep patterns. And how do we deal with feelings of unrest or anxiety? We move. We wring our hands, we pace, we clean- we try to work through our issues through movement. Maybe some of us talk it out or write down our thoughts to clear our minds, but language is frequently impaired in Alzheimer's which is yet another source of anxiety for the person. So as far as actual solutions go, either we reduce the activity in the overactive brain through meds or distraction, or we increase the movement opportunities while awake. CARNOSINE PROTECTION AGAINST CIRCADIAN DISORDERS CAUSED BY "JETLAG".CARNOSINE is a well known support therapy in small doses (only under physician prescription) as a neuroprotector ,working as a peroxinitrites scavenger,antiglycating , mild heavy metal chelator ,lowers betamyloid accumulation,etc. In the article with the title : " The Effect of L-CARNOSINE on the Circadian Resetting of Clock Genes in the Heart of Rats" , by the authors Wu T. and colleagues, published in the journal Molecular Biology Reports (January 2015),we can read:"It is reported that the CIRCADIAN TIMING SYSTEM may be included in the mechanism by which L-CARNOSINE "PROTECTS" against multiple physiological alterations including blood glucose, cardiovascular functions etc. To clarify these issues, the authors compared the EFFECTS of CARNOSINE ON THE EXPRESSION OF CIRCADIAN GENES IN THE HEART OF RATS UNDER CONTROL AND JET LAG CONDITIONS. CARNOSINE FEEDING OBVIOUSLY ENHANCED THE RESETTING RATES OF CLOCK GENES in the heart of normal rats after the experimental JET LAG.CARNOSINE FEEDING PLAYS A POSITIVE ROLE IN THE CIRCADIAN RESYNCHRONIZATION OF THE HEART CLOCK"
DO NOT USE PHRASES LIKE "...these symptoms are curable." I have Alzheimer's and so many media outlets use "hooks" like that to get clicks. This media outlet is now on my "Fake News list". I am adding a page to my website listing fake news sites like yours. Go to www.withalzmyheart.com to fing good links. I care for my mother with severe dementia for 5 years now. When I first started living with here she had sun downing. I have since bought her a S.A.D. Lamp. And she has not have any sun downing since.